Over 100 tips help you convert DVD and video to iPhone 5s, iPhone 6, iPhone 5, iPad Air, iPad mini 2, iPhone mini, iPad 2, Apple TV, etc. AVI on Android – How to Solve AVI Android Playback Issues? How to Convert FLAC Files to iTunes in Batches? How to Convert MP4 to iPad for Smooth Playback? How to Watch VR Video with Two Simple Ways? iPod Touch 4 Video Converter - Something That You May Not Know. iPod Movie Video Converter - Enjoy the Cute Videos. iPod Classic Video Converter - Beyond Your Imagination. AVI to iPod Video Converter – Hold the Classic AVI. 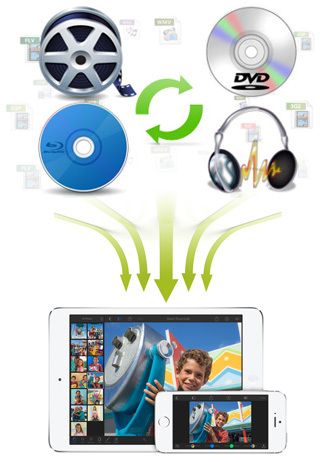 iPod Touch Video Converter - Music and Video Everywhere. iPod Nano Video Converter Needs to Consider More. Convert Video to iPod nano - Enjoy Your Cute Videos. Convert Video to iPod Touch - Good Life, You Make. iPhone4 Video Converter - Follow The Trend. Convert FLV to iPhone - Help You Release Pressure. iPhone Video Converting Software - Making Your iPhone More Magical.